One of the most popular self-defense and police rounds available today, Speer Gold Dots use a bonded hollow point design that virtually eliminates the problem of core-jacket separation and produces reliable expansion on assailants. 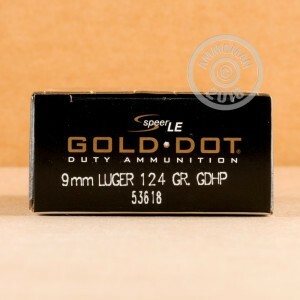 Gold Dots come in a variety of cartridge types, with each bullet optimized to perform well in that particular cartridge. This 9mm Luger version uses a balanced 124 grain bullet and a standard pressure loading for low recoil and faster follow-up shots. Non-corrosive Boxer primers from CCI and nickel-plated brass cases round out the package. A great carry load for the new Springfield XD 4.0 or any 9mm Parabellum compact pistol such as a Glock 19, Sig P938, or Smith & Wesson M&P Shield. 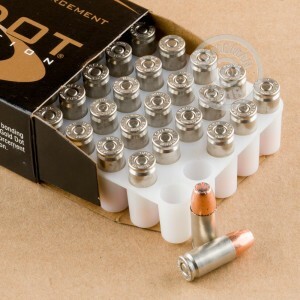 Unlike some self-defense ammo, Gold Dots come in 50-round boxes, with 20 boxes in each case. 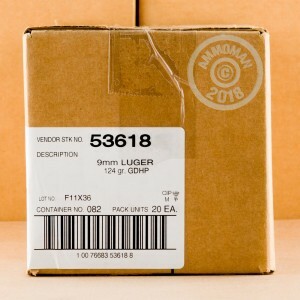 Buying this 1,000 round case takes the premium price out of this premium ammo--and AmmoMan includes free shipping, as it does with all orders over $99. Top quality self-defense ammo with a long track record of real-world success and an affordable price--what are you waiting for?